Hailing from the London borough of Bermondsey, the Handley Family were – for a very short period – touted as England’s answer to the Partridge Family, the Osmonds and the Jackson Five. The five siblings (three girls – Molly, Wendy and Sally - and two boys – Tommy and Billy) appeared on Hughie Green's talent show Opportunity Knocks and released at least three singles, the first of which managed to scrape into the UK Top 30 in 1973. There was at least one further sister, Julie, and Sally had previously sung with the showband Sweet Rain. 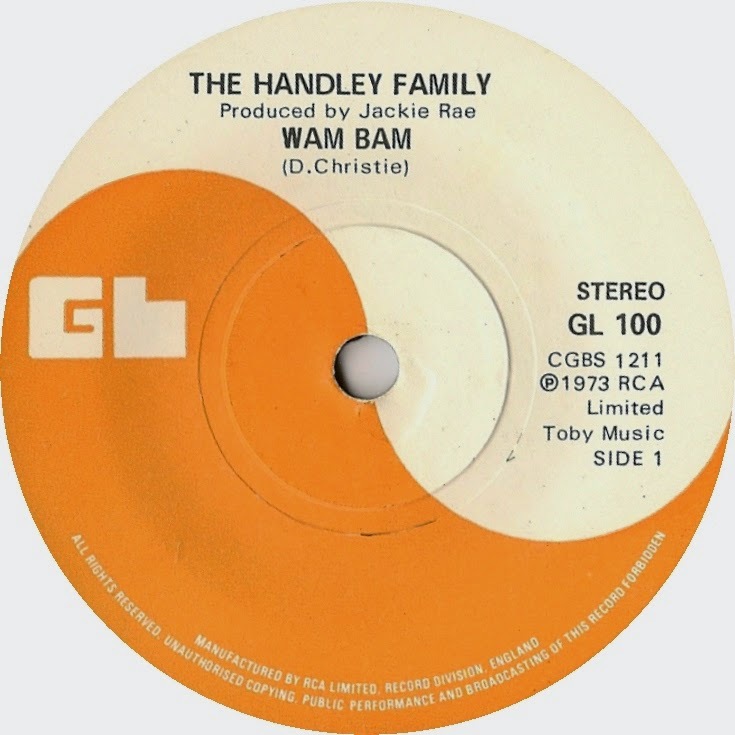 Issued on RCA imprint GL the A-Side, Wam Bam is pretty typical of its type and time, a singalong country song – written by Dave Christie (who would become the group’s producer) - that would keep a Sunday night TV audience tapping their feet for a couple of minutes between acts on any televised variety show. You can easily imagine this song being covered by Op Knocks superstar Lean Zavaroni. The B-Side, however, is another matter. Rum, Dum and Baccy is downright awful, with ludicrous lyrics which in no way reflect the particular type of alcohol or the cigarettes mentioned in the title. Also, the kids clearly sing Rum Dum DUM Baccy all the way through the song, rather than the correct Rum, Dum AND Baccy. Just stupid. And that’s it: that one verse repeated twice. Great bongoes though, and at least the writers Dave Reece and Steve Glen - who would go on to release the frankly ridiculous and overblown Jim Steinman rip-off Down Among the Dead Men (the Story of the Titanic) on CBS in 1980 - saved embarrassing the children by avoiding the use of the word 'randy'! The Handley kids, all too young to enjoy the delights of booze or tobacco would go on to release two further 45s on Dave Christie’s Tiffany label (Boing Boing Boing/Chuggin’ Along and Light Up the World With Sunshine/Joanna May), with the Handley sisters also being roped in to sing backing vocals on other sessions for the company: they can be heard prominently on recordings by ‘comedian’ Freddie Starr, who co-incidentally was also a former winner of Opportunity Knocks. There were a few live appearances, including being the star attraction at the Bermondsey and Rotherthithe Carnival, where they arrived in an open-top limousine. They also appeared on several other TV shows, including kid’s teatime staples Crackerjack and Lift Off with Ayshea. Their time in the spotlight was brief; the kids grew up, left school, put their music career behind them and brought up families of their own. 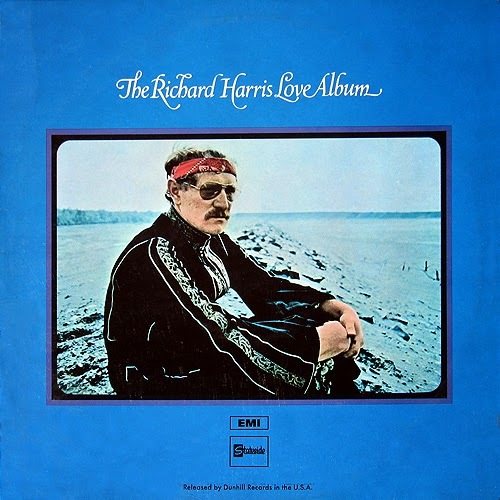 Released in 1972, the Richard Harris Love Album is a ridiculous time-capsule of grandiose schlock, and a thoroughly justifiable exhibit in our museum of oddities. Some people love this kind of thing: the same people who like early Al Stewart and drink Mateus Rose no doubt. Consisting primarily of tracks from his first three (yes, I know, there were Richard Harris albums before, and after, this horror) plus both sides of his latest single – taken from the recent musical remake of Goodbye Mr Chips – The Richard Harris Love Album is basically a ‘best of’ the Irish-born actor’s early recordings although, confusingly, one or two tracks have been renamed and could easily confuse the casual buyer into thinking he or she were getting new product for their pounds. Listen to One of the Nicer Things, and make up your own mind. It’s understandable that Webb would want to support his mate’s performance, especially as Harris is no longer here to answer for himself: the Oscar- and Golden Raspberry-nominated actor passed away in 2002. He’s probably best remembered these days for having played Albus Dumbledore in the first two Harry Potter movies but his filmmaking career spanned more than 40 years. Still, I’m pretty sure you’ll agree that his voice is awful: a thin, reedy wail that often misses its mark. Webb and Harris, of course, collaborated on the overblown horror that is MacArthur Park – and Webb’s own story of how that particular track was recorded makes for enlightening and entertaining reading. “I recorded the basic track back in Hollywood, with myself on harpsichord accompanied by session musicians the Wrecking Crew. When Richard did the vocals at a London studio, he had a pitcher of Pimm's by the microphone. We knew the session was over when the Pimm's was gone. “We had doubts about releasing it as a single, but when radio stations began playing it I was asked to do a shorter version as a single. I refused, so eventually they put out the full seven minutes 20 seconds. George Martin once told me the Beatles let Hey Jude run to over seven minutes because of MacArthur Park.” Incidentally, Harris was not the first choice to record MacArthur Park: the song had originally been offered to The Association, who turned it down. I’ve also included First Hymn From Grand Terrace which, on the disc’s label is listed as The First Hymn From Grand Terrace (Part 2), but was originally part of a suite of songs that appeared on the second Webb/Harris album The Yard Went on Forever entitled The Hymns From The Grand Terrace) If the arseing around with the title doesn’t annoy you, the performance will. Harris’s forced vibrato is uncomfortable to listen to, and the strain in his voice when he hits the key change hurts my ears. Coming out of a Dansette, in a bedsit full of scatter cushions and thick with marijuana smoke this probably sounded brilliant...I can see how a young lady would be wooed by Jimmy's seductive lyrics and lush arrangements, but today it’s a kitsch reminder that, back in the 60s, people would buy anything. Although Harris would release several albums of new material after he and Webb parted company, he would never again reach the heights he once did. Whenever I’ve asked you what your favourite (or, more likely, least favourite) bad record is, one title rears its ugly head again and again and again, and it is that record I bring to you today, complete with its seldom-heard B-side. 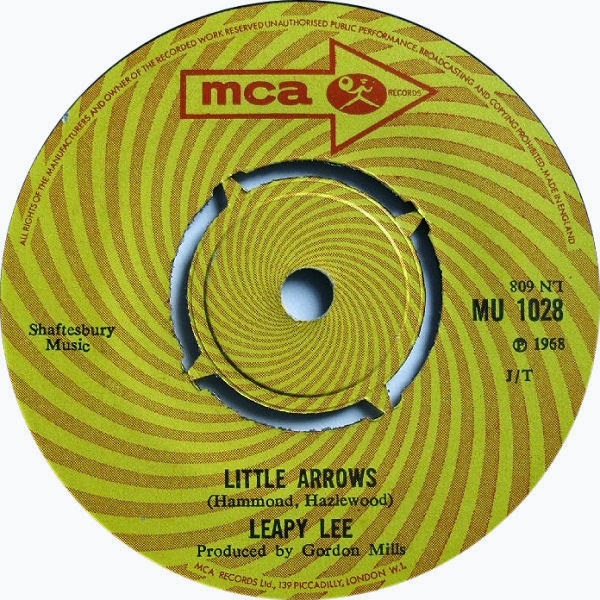 An appalling ditty with nonsense lyrics, this particular monstrosity - Little Arrows by Leapy Lee - was a huge hit: Number 2 in the UK and Australia, Number 11 in America, Top 10 in Canada and a Number One smash in several European countries. It’s still horrible though, and it’s no surprise that it regularly turns up on bad record lists. Luckily this was denied the top spot by the first two releases from the Beatles’ Apple records - Hey Jude and Those Were the Days. Little Arrows was co-written by Albert Hammond, whose song writing credits include The Air That I Breathe, Don’t Turn Around, When I Need You, One Moment in Time, Nothing’s Gonna Stop Us Now – and Gimmie Dat Ding. Hammond – who knew Lee through their mutual friendship with Dave Davis of the Kinks – gave him the song “because,” he told DJ and writer Jon Kutner, “He said he was a singer and I couldn’t get anyone else to record it.” Lee, Hammond states, “was a jack of all trades; he’d been a comedian, an antique dealer, a fruit seller and even a bingo caller in Shepherd’s Bush!” Perhaps what is surprising is that this was not Lee’s first recording: three years earlier he released the self-penned It’s All Happening on Pye. Nor, unfortunately, would it be his last. It would, though, be his only major hit. Later covered by Little Jimmy Osmond, Leapy Lee re-recorded and re-issued the song in 2010. Lee is a funny old character. Still performing today at the grand old age of (almost) 75 – mostly around Mallorca, where he has lived since the early 1980s – he’s perhaps better known locally as a rather reactionary columnist for the ex-pat English-language newspaper the Euro Weekly News...although I suspect the irony of his being rabidly against immigration whilst being an immigrant himself is no doubt lost on him. Born Graham Pulleybank in 1939 (he would later change his name to Lee Graham); he’s also very down on criminals – odd when you consider his own brush with the law. His chart career was nobbled shortly after his second US hit when, in July 1970, Leapy found himself in the Chequers Pub in London's West End with actor Alan Lake (who, at that time, was married to WWR alumnus Diana Dors). A fight broke out and the pub’s relief manager was stabbed - allegedly by Lee, who was sentenced to three years in prison. Lake got 18 months. Little Arrows is bad enough, but you’ve yet to hear the dreadful B-side, Time Will Tell. Co-written and produced by Gordon Mills, the legendary manager of Tom Jones, Englebert Humperdinck and Gilbert O'Sullivan, it’s an absolute shocker. Mills, who also wrote or co-wrote hits for Cliff Richard, the Searchers and others, really dropped the ball with this piece of rubbish, but even if the song had been world class it would have been ruined by Lee’s ridiculous performance. I quite like the Joe Meek-esque compression, but the song itself is totally unsuited to his mediocre voice, and Lee’s constant straining to hit the right notes (and failing miserably) makes for rather uncomfortable listening. You’d have to hope that he was aiming for something comedic - but it doesn’t make me laugh. Born on May 15, 1918, Richard Edward ‘Eddy’ Arnold was one of country music’s most popular performers, with a career that spanned six decades, 147 hits on the Billboard Country Music charts and sales in excess of 85 million records. A pioneer of Nashville sound (the country-pop crossover popularised by Arnold and stable-mate Jim Reeves), he was ranked 22nd on Country Music Television's list of The 40 Greatest Men of Country Music in 2003. Nicknamed the Tennessee Plowboy (because he grew up on a farm and started his performing career while still working there), he was signed by Colonel Tom Parker more than a decade before the Colonel would get his claws into Elvis Presley, and cut his first disc – a schmaltzy piece of hillbilly music called Mommy Please Stay Home with Me - in 1944. That flopped, but the follow up (Each Minute Seems a Million Years) was a top five hit on the country charts and began an unprecedented run of 57 Top 10 hits. Although his appeal waned with the advent of Rock ‘n’ Roll, in the middle of the 60s he had an unexpected resurgence, with two massive hits, What's He Doing in My World? and Make the World Go Away. “I’ve never thought of myself as a country-and-western singer,” he told a reporter from The Charlotte Observer in 1968. “I’m really a pop music artist. I want my songs to be accepted by everyone.” By 1969 however the pop hits dried up, although he continued to score hits on the country charts until 1983. 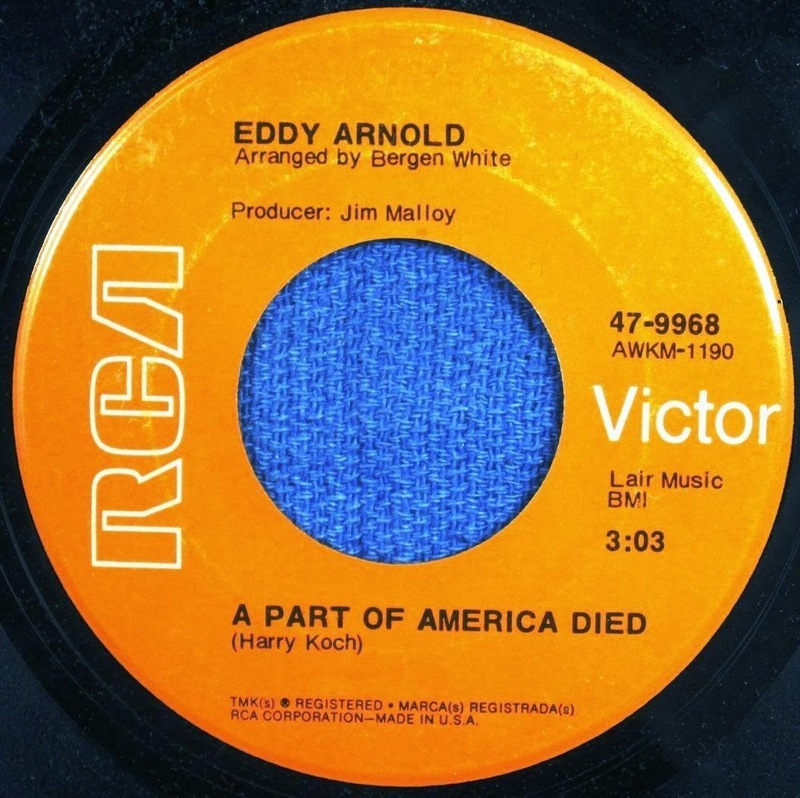 In 1971 he released what was easily the most misguided song of his career, a woeful piece of right wing propaganda entitled A Part of America Died. Arnold, known for his smooth vocal style, felt that this particular portentous piece of crap needed something different and decided to recite the song’s scaremongering lyrics whilst a choir hammered home the message by mumbling a hymn in the background. A stalwart Nixon supporter, Arnold was so convinced his record would sell to the moral majority that he regularly called RCA sales reps around the country to check on its progress. The lyrics to this awful dirge were even mentioned in the United States Congress when Mario Biaggi, the representative for New York’s 24th District and a former policeman himself, rose to his feet and quoted parts of the song to the rest of the House of Representatives. Despite that, and in spite of a Billboard review which claimed that ‘this potent message could easily prove an important pop item’ the single struggled to gain a footing in the country charts – peaking at a miserable 41 - and failed to provide him with a much-wanted crossover hit. “I’ve always picked good song,” he told Michael Streissguth. “I always picked a good lyric, and that gave me a wider audience than just the country buyers. I did that on purpose. I never was political about songwriters.” Boy, did he pick a wrong ‘un this time. Disappointed by the lack of mainstream success, he followed it up with a cover of the Jim Reeves classic Welcome to my World, which limped into the country charts at 34. Arnold died, in a care facility near Nashville, on May 8, 2008, just two weeks before his 90th birthday. Just three weeks later RCA issued To Life, a cut from Eddy’s final album (recorded and released in 1996). The song debuted at 49 on the Country charts, setting the record for the longest span between a first chart single and a last: 62 years and 11 months, and extending Eddy's career chart history to seven decades.